Great adventure amazing culture Exceptional. Beautiful and amazing Mountain views. 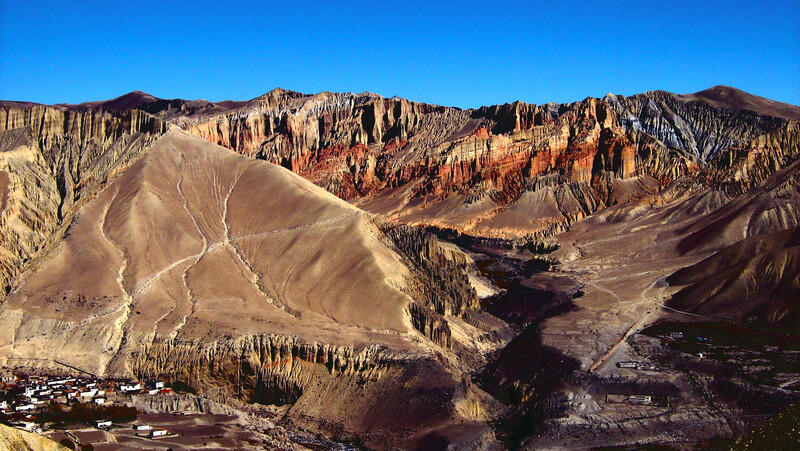 Upper Mustang Trek, a scenic adventure which leads you on moderate to adventurous walks with amazing views of arid dry canyons, eroded windswept hills of enchanting colors of orange-brown-grey dotted with holy holes, where ancient treasures of script-books and idols were kept hidden. 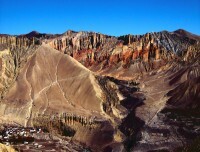 upper Mustang Trekking, a mind-blowing experience full of picturesque views on daily walks certainly a photographers delights on this ancient Trans Himalayan Salt and Caravan Trail of Nepal and Tibet, where the bartering and trade still takes place between the border of high Karo-la pass that separates the two countries. 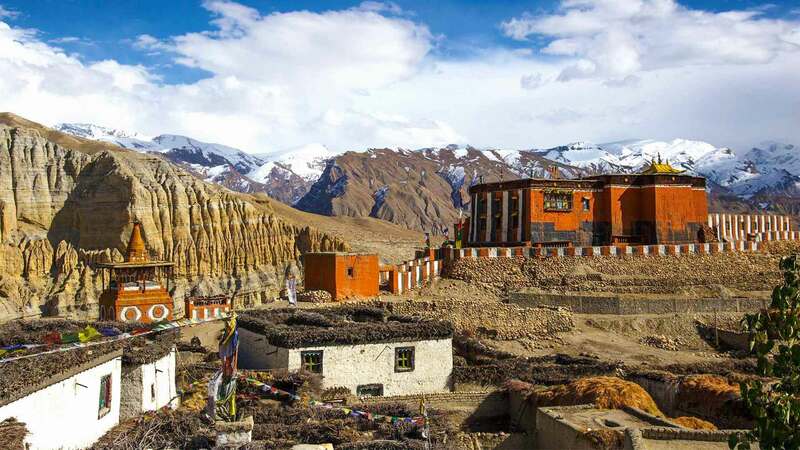 Upper Mustang Trek a great adventure within amazing views rolling hills with snow capped peaks on daily walks Explore Lower and Upper Mustang villages enriched with Bon and Buddhist traditions Walk in lovely farm villages. 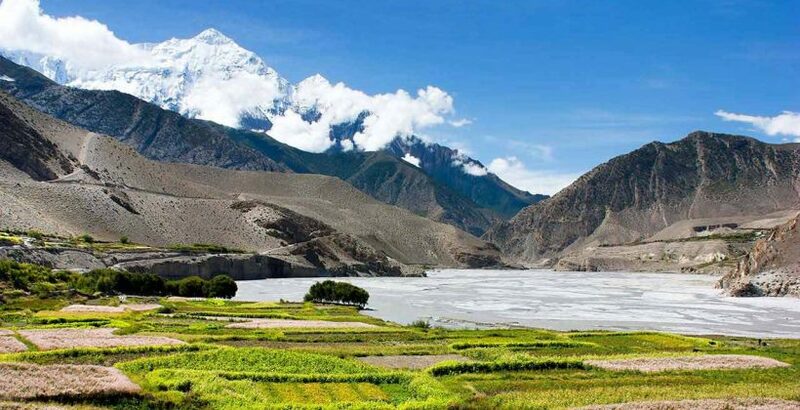 Starting this awesome journey towards Upper Mustang Trek an early morning scenic flight from beautiful Pokhara city, blessed with natural wonders of high Annapurna Mountains, rolling green hills and serene lakes. On reaching at Jomsom, the headquarter town of whole Mustang district where our adventure begins following the old trade route via Kagbeni-Chusang and Tsarang villages encountering many holy sites and monument of long prayer wheels and decorated stone wall, then reaching our main highlight and goal of the adventure at Lo-Manthang the walled city (village) once a forbidden kingdom till early 21st century. Adventure towards ancient Trans Himalayan Caravan route of Nepal / Tibet. Rolling hills with snow capped peaks on daily walks. Highest altitude at 3,950 m at Lo La pass and Dhakmar with 3,810 m high. Scenic drive/flight to Jomsom and back to Kathmandu. 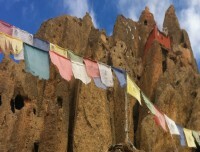 Visit Historical place including Kagbeni and Lo-Manthang. The very beautiful backdrop of Dhaulagiri, Nilgiri. Best views of Himalayas range. 1 Arrive in Kathmandu via respective airlines and transfer to hotel.On arrival at Kathmandu international airport you will be well received by Responsible Treks & Tour staff and guide and then transfer you to your hotels within the hub of Kathmandu city around the most happening and exciting place around Thamel. Evening after checking into your rooms with refreshment our guides will brief regarding Upper Mustang Trekking with welcome dinner in a nice authentic Nepalese restaurant with culture show. 3 Drive to Pokhara 950m (30 mins flight and 6 hrs drive)Leaving early for Upper Mustang trekking taking an overland drive to scenic Pokhara city, blessed with amazing natural scenery of rolling green hills and lakes in the shade of massive Annapurna Himalaya with majestic Machhapuchare “Fish Tail'. Drive about 5-6 hours within 220 k.m. distance on reaching Pokhara transfer to respective hotels by the Phewa Lake. traveling by air, which is 30 mins panoramic flight with awesome views of mountain range all the way landing at Pokhara. 4 Morning Flight to Jomsom 2,700 and trek to Kagbeni - 04 hrs.After a wonderful stop at Pokhara, depart from the hotel for an early morning short scenic flight to Jomsom, during airborne views of Annapurna and Dhaulagiri mountains and then reaching at Jomsom small airstrip, located on the shelf of Kali-Gandaki River. Jomsom, headquarter town of Mustang district, after Jomsom first day trek begins on Kali-Gandaki river valley around windswept country. afternoon time carries heavy wind, after few hours of great walk with super views of Mt. Dhaulagiri, Nilgiris and ending our first day walk at Kagbeni village for overnight stop. Kagbeni a windswept Tibetan like village which is the starting and ending point of Upper Mustang, located on an old Himalayan Caravan Salt Trade route of Nepal and Tibet. 5 Trek to Chele (Tsele) 3,050m - 06 hrs.Morning walk leads on uphill trail into canyon and high red eroded cliff edge, then following upper Kailgandaki River upstream, around unique landscapes of cliff wall in-between walking trails. This nice walk with views leads to our overnight stop at Chele village, a moderate size settlement. 6 Trek to Geling 3,540 m - 05 hrsrom Chele (spelled as Tsele also), morning walk begins with a climb to Gyakar village, and from here trek around dry and barren landscapes to reach at Samar village, one of the lovely looking villages of Mustang area. after Samar village with short stops walk to Bhena and then leading with a steep climb to a ridge top of Yamda La pass at 3,860 meters high, offering grand vista of Mustang area with high mountains of Mt. Dhaulagiri. from here on down-hill to overnight stop at Geling village via Syangboche village. 7 Trek to Tsarang (Charang) 3,560 m - 06 hrs.Morning visit old Geling monastery and explore the Buddhist mani prayer wheels propelled with water power, after monastery tour trek towards Ghami village, and then leading to cross Ghaymi Khola (stream) walk leads following a long and interesting line of Mani walls (holy prayer stone) from here walk to Dhakmar village. after few hours of pleasant walk reaching at Tsarang village surrounded by large fields of crops like buck wheat’s for overnight stop and visit of Tsarang old monastery. 8Trek to Lo-Manthang 3,700 m - 04 hrs.Today a short day walk to Lo –Manthang our main destination of this classic journey to the wall city (actually a large village) guarding this city / village surrounded by high wall. at one time stood as a forbidden kingdom after monarchy rule ended in Nepal few past decade, morning walk starts crossing a steel bridge, and then to Marang village. 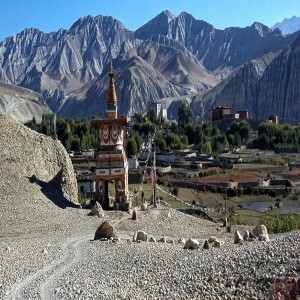 from this village climb to reach a scenic ridge top, coming across several chortens and mani stones,between Tsarang and on Lo Manthang trail with grand views of arid landscapes in the shade of Nilgiri’s, Tilicho and Bhrikuti peaks. walk leads to a climb over Lo La pass at 3,950 meters with first views of Lo Manthang walled city and its fort like village. From here descend to the bottom of the pass and on nice trail to reach at Lo Manthang for two nights stop. 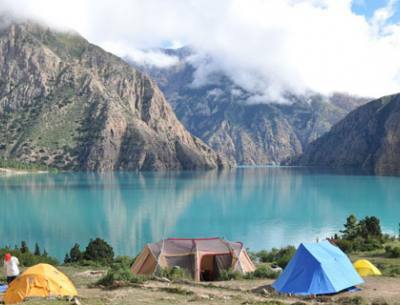 9 In Lo-Manthang for acclimatization and local hike.Lo Manthang highest overnight stop of this journey, with time to explore this fascinating village with old Tibetan like houses enclosed within great high wall, visit historical and cultural centre the main attraction of Lo-Manthang. the four main monasteries are Namgyal Gompa, Champa Lakhang (God House), Red Thubchen Gompa, Chyodi Gompa and the great Entrance Hall. advance permission required to enter king’s palace to visit interior of the old palace and to grant audience with former king or Raja of Mustang if possible. 10Trek to Dhakmar 3,810 m - 06 hrs.After an interesting time in Lo-Manthang morning walk starts on the same route back to Marang village, and then walk west using an old path to Dhakmar village for overnight stop. 11 Trek to Ghiling 3,806 m - 06 hrs.From Dhakmar village, morning walk heading on the same route with long series of Mani Walls, and then cross a bridge over Ghami Khola to reach at Ghami village for overnight, time permitting visit Geling monastery. 12Trek to Tsusang (Chusang) 2,980 m - 06 hrs.Slowly this fascinating walk comes to an end after a short climb to Syangboche village, and to Yamda La with grand views, then downhill to Bhena and Samar villages. walk leads by a stream passing Gyakar and Chele villages and finally ending this nice walk at Tsusang village. 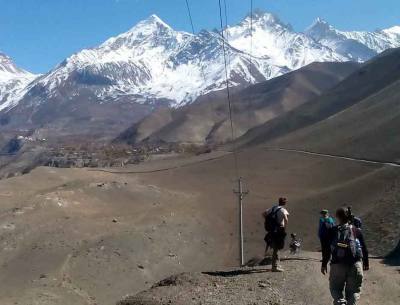 13Trek to Kagbeni 2,830 m - 05 hrs.Morning walk back on same trail to Kagbeni village after an interesting and exciting time around Upper Mustang, a nice and pleasant walk brings reaches at Kagbeni village before concluding the walk at Jomsom. 14 Trek to Jomsom 2,715 m - 04 hrs.Today our last and final day of this beautiful Upper Mustang trekking, morning walk starts on the same route to Jomsom town, after retracing Kaligandaki river valley trail to reach in Jomsom and overnight in a nice fine lodge. Jomsom area from Kagbeni to Larjung is famous for delicious apples and products cider, brandy and juice. Celebrate last night dinner with staff and among other teams. 17International Departure for Homeward bound.As per your international flight time transfer towards Tribhuvan International Airport for the journey back home or to respective destinations after a super and amazing time in Nepal Himalaya on high hills around Upper Mustang Trekking. Three Night standard hotel accommodation in Kathmandu with breakfast. Two Night standard hotel accommodation in pokhara with breakfast . Guided sightseeing tour in Kathmandu including taxes and entrance fees. An experienced, English-speaking and government-licensed trek leader.(Guide). It's been my dream to take a trip to Upper Mustang Trek I book 17 Days upper Mustang Trek with Reasonable Treks And Tour Company. i am so Happy This Trekking guide also helpful fantastic Mr. Anil he is The Organization for 17 Days Upper Mustang Trek. Mr. Anil he is is young and fantastic guys. He is Also last Days Completely farewell Dinner Nepali typical Resturant with culture dance Show Program. Mr. Anil He is giving to fantastic Trip.we enjoy the This Trip. Thank you so much Anil We will back Next Time !! 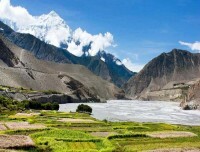 This is my first Time Nepal I did 17 days Upper Mustang Trek, with Reasonable Treks & Tour Pvt. Ltd / Anil Dhungana provided Very Helpful And professional assistance in planning for Upper Mustang Trek, he’s is Organization for 17 Days Upper Mustang Trek Mr. Anil He is Recommendation Trekking Guide and porters, he’s is Guide and porters very friendly And honestly Guide he gives to everything information details on the way I Show village and mountain. Really enjoyed the Upper Mustang Trek, Thanks to Guide And porters we want to highly recommend this company and staff for other travelers. Thank you so much, Mr. Anil, we really happy for your Trip. We will back Next Time!! While in Kathmandu at 3 star Hotels (Attached Bath Room A/c,24 hours running hot and cold shower while you are Upper Mustang Trekking Day Begins Breakfast at Lodge teahouse Thy are clean and comfortable bed and the rooms are basic, normally just a bed with a pillow and blankets .every day 3-4 hours trekking and break for lunchtime, after a relaxing lunch, you typically spend around 2-3 hours or even more sometimes on the trail before reaching your stopping point teahouse . Reasonable Treks And Tour Will Provide Private Vehicles and tourist bus for The Airport transfer, Kathmandu Sightseeing Tour in Kathmandu .and Drive Kathmandu to Pokhara and return back to Pokhara to Kathmandu. you can Take flight (30) minute flight to Pokhara to Kathmandu extra fare. The meals are included in our package of the Upper Mustang Trekking and They are taken in lodges, we will have breakfast and dinner at the lodge where we stay overnight and our guide will choose and stop For lunch on trek and we recommend you to bring water purification pills since you will have normal water for free, then you can have the normal water and use the medicine and drink however you have options of buying bottled water or boiled water in every place as well. There will also be farewell dinners for guests in Kathmandu. There is electricity available in some of the villages on our Upper MustangTrek where you can recharges your camera, batteries, mobile Phone and there is solar power in some villages. we trek through and you can recharge your batteries camera mobile Phone in those places as well if they have enough power and we suggest you to have spare batteries as well and you will have to pay some for recharging batteries.on Upper MustangTrek. Your main luggage will be carried by porters on Upper Mustang Trek And you simply carry a day pack with water bottle, camera, sunscreen, spare jacket, and etc, during the trek, as small loads allow you for full enjoyment of the trek. A trek bag is ideal for your main luggage, plus a small lockable bag for travel clothes or anything that you do not need during trek which you can leave at hotel’s locker room/safe deposit box in Kathmandu for free of charge. We provide trained trekking guide (handles the logistics and guides you and your team on the trek) and porters, one porter for every 2 trekkers and a porter carry about 20 Kg and if there are more than 10 people in the group then we will provide you an additional guide for the group. Reasonable Treks And Tour organize Lower Mustang Trek for single people to maximum 13 people at once or even if you have more than 13 people then we can split the group in to two or more groups (according to the number of trekkers) however you all can walk together and stay at same guest house and there are only different guide, and there are 1 guide up to 9 people and 2 guides for 10-13 people and One porter for each 2 Trekkers. Personal expenses depend largely on your habit and as the meals are included on our Upper Mustang Trek cost, so, you only need money for table drinks (alcoholic/non Alcoholic beverages), snacks while walking (some smaller shops are available along the trail in the areas), tips, souvenirs, hot shower (available in some places), and Meals ( A meal cost 5-7USD in Kathmandu) for your Kathmandu stay, entrance fees ( approx: 25USD) while your tour in Kathmandu, if you Do not drink alcohol and sopping then 12-15USD per day should be enough for the hot drinks, shower and snacks on trek and Tips are appreciated by your support Team after the trek. The amount depends on your budget and appreciation of their work. 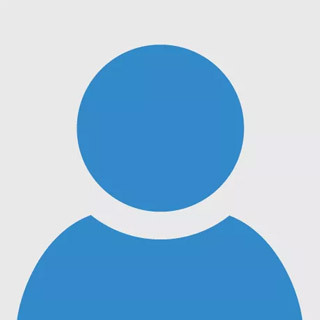 As a suggestion, we advise you to allocate 15 - 20% of the total tour cost as Tips to the staff and you can do this if you feel the services have been good. It's not necessary to spend a lot of money buying equipment for the Lower Mustang Trek in your country as Majority of these gears can be bought at Reasonable Cost in Kathmandu. The best time to trek to the Upper Mustang Trek is spring March, April, May, and autumn August, September, October, November. The temperature is moderate in these seasons and guarantees amazing views from the trip. Although this trek can be undertaken during winter, the cold temperature might not be suitable for everyone. In case of a serious sickness or a casualty while you are on Upper Mustang Trek (which we believe will not happen), we will do everything to transfer you to the Nearest hospital to save your life (this has happened to us few times) and you are entirely liable for all the expenses incurred in evacuation/rescue, so, please make Sure that these expenses are covered by your insurance policy before assigning for the trek or be prepared to pay on your own after getting back to Kathmandu. 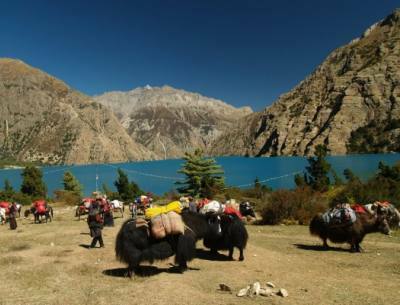 Ensure That you’ve insured yourself before doing the trip, Common sense dictates this, it’s good for you and please visit Nepal Travel insurance page for more info about it. Reasonable Treks And Tour Pvt. Ltd We provide The Price per Person is fixed as stated below. we provide for group Discounts of 15% for booking of 5 or more than 5 persons. If a group booking of more than 10 person people we Discount for 20% your Trip. Note Start Dates are your arrival date in Nepal and End dates are the returning date from Nepal.